At Shorecrest this year to honor Peace Day, Lower School classes shared the book “Say Something.” The book's message is to stand up for others and not remain silent when witnessing an injustice. Speaking up promotes peace. Students were invited to create their own representations of how they say something for peace and share them at a Town Meeting on September 22 (including drawings, short poems, and LEGO creations. )A group of second graders performed a movement of peace led by Lower School Music Teacher Mr. Mitchell. Third and fourth graders sang a song “The Children Want Peace” in Spanish, led by Sra. Jaime-Allwood. Our youngest students in The Experiential School of Tampa Bay shared a peace symbol filled in with peace rocks they painted themselves. Middle School students made peace mobiles out of recycled bottle caps and found materials. Fifth graders divided up materials for the other Middle School grades to use, and in advisory everyone made mobiles. 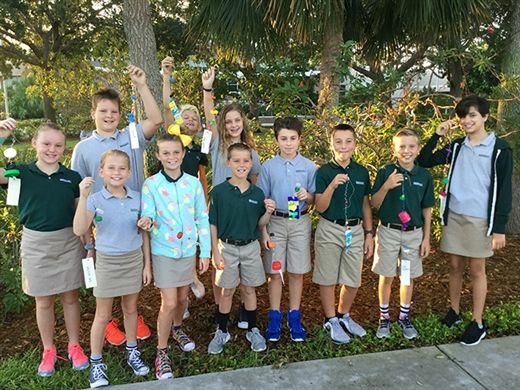 On Peace Day, Middle School met during CPR and hung the mobiles in trees around the campus to send peaceful wishes throughout the world.